Here are some tips on how to be a good dad and help your kids through this difficult time by recognising bullying and helping put a stop to it (without getting all Clint Eastwood about it). As a dad, there’s no single way to tell if your child is being bullied. Unless your child tells you directly, it can be hard to tell that they are being victimised, but there are some warning signs you can keep an eye out for. Complaints about ailments like headaches or tummy aches. Seeming anxious, moodier or more easily upset than usual, especially at the end of weekends or holidays when a return to school is imminent. Breakdown of friendships both in and out of school. These signs don’t necessarily mean your child is being bullied, but they are signs that something is bothering them. They could be signs of other issues, like social difficulties, depression or even the normal effects of growing up, especially for teenagers. As a good dad, if you have concerns about your kids, have a chat about it to your GP or other health professional. Getting angry – you need to model the right behaviour for your child, as they learn most often from studying those around them. A good dad shows them that anger and aggression is not the answer. Taking matters into your own hands and directly confronting the bully or their parents. Making negative comments or blaming the victim by telling your child to ‘stick up for yourself’ or fight back. Dismissing their concerns or ignoring their wishes for the matter to stay private. The bullying may get worse if the bully finds out that your child told someone. Address the situation as soon as possible. Talk about it! Let your kids know it’s important to talk to someone about the bullying, whether it’s you, another adult like a teacher or family friend, or someone else they trust. A good dad is a great confidant. If they choose to talk to you about the situation, listen to them calmly, offering comfort and support. Praise your child for doing the right thing by speaking up and let them know you are always willing to listen. Make time each day to hear about their lives, the good and the bad. Remind them that they’re not alone – a lot of people get bullied at some point and go on to lead very successful lives. Help them understand the motivations for bullying – often it is to gain self-esteem or bad guidance in the bully’s life. 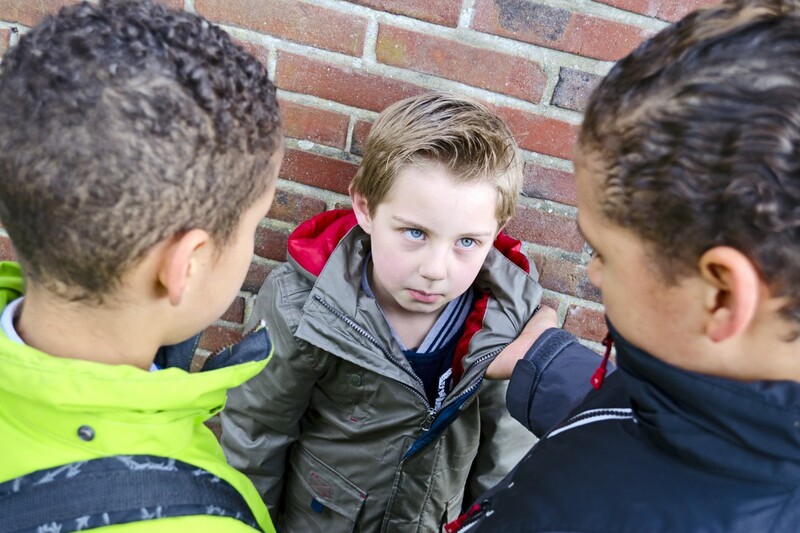 Emphasize that it’s the bully who is behaving badly and it’s not your kid’s fault. Let them know you will figure out what to do about it together. If the bullying is for money or possessions, remove the bait by packing their lunch and leaving desirable items at home. Teach avoidance strategies. It’s sensible to advise your child to walk away from the situation if at all possible. This is the safest response that avoids further trouble. Advise them to avoid places where the bully might strike and to use the ‘buddy system’ with a friend to minimise times they are alone and vulnerable. If the bullying occurs online, teach them to keep evidence of the messages and learn how to employ blocking tools. A good dad teaches social skills. Practice ways to be assertive without aggression and to keep their anger or fear in check. Strategies like role playing, writing a script, counting to 10, writing down their feelings, taking deep breaths, or maintaining a ‘poker face’ can reduce the victim mentality that bullies feed upon. A good dad builds their kids’ confidence. Encourage time with friends who have a positive influence and involvement in activities they enjoy. Get involved in their life. Keep up to date with newsletters, websites and regular meetings with authority figures. Make yourself known to the adults they encounter every day and establish lines of communication. Discuss the matter with someone at the school (with your child’s approval). This may be their teachers, principal or the school board if need be. If the school does not act swiftly to resolve the situation and you believe the situation is serious, consider contacting the police or taking other legal avenues. In extreme cases you can think about changing schools, with the child’s permission. View our Being a Dad section for further information to help you up your dad game. Remember, if you need someone to talk to about how to be a good dad, give one of our MensLine Australia counsellors a call on 1300 78 99 78 or register for online chat.